Successfully Added Sea Lion Waterproof MP3 Player (4GB) to your Shopping Cart. Modern waterproof technology meets digital music player with the new Sea Lion Waterproof MP3 Player. This cool gadget is the best way to enjoy crystal clear audio when swimming in the ocean, relaxing by the pool, or even taking a shower. Best of all, the huge 4GB of memory is great for holding all your favorite tunes. 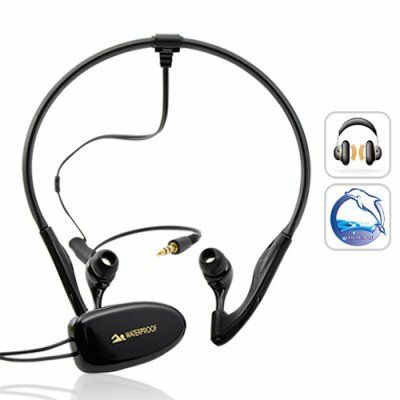 Completely Waterproof Both the earphones and MP3 player come with a certified IP rating of IPx8, meaning they are completely waterproof. Aside from being able to freely enjoy music while taking a bath or just relaxing in the jacuzzi, the Sea Lion Waterproof MP3 Player is also perfect for swimming, surfing, sailing and all water sports where music adds to the fun but water would normally be a problem. Maximum Comfortable Designed around the concept of lightweight, comfortable, and convenient, the necklace-like style of the Sea Lion Waterproof MP3 Player will hardly be felt as it hangs securely around your neck. In addition, the easy-fit earphones are shaped to sit comfortably around your ear while the earbuds will even prevent water from entering. Massive 4GB Memory With the 4GB internal memory, the Sea Lion Waterproof MP3 Player can hold thousands of songs to provide you hours and hours of your favorite tunes. Transferring files to the device is done through a plug-and-play USB 2.0 connection to your computer (just like a USB flash drive), so you can be up and running almost instantly. Add audio enjoyment to your favorite water sports and activities with the Sea Lion Waterproof MP3 Player. Available in our warehouse now and brought to you at our usual low factory-direct wholesale price, order today and we will express ship it tomorrow, guaranteed! Brought to you by the leader in wholesale electronics and audio gadgets - Chinavasion. Be sure to cover up both slots on the device before submerging in water. Does it matter whether it's salt or fresh water I swim in, will the waterproof MP3 player still be protected? This waterproof MP3 player, can be used in beaches, swimming pools, lakes, rivers, oceans and pretty much anywhere you enjoy swimming or diving.